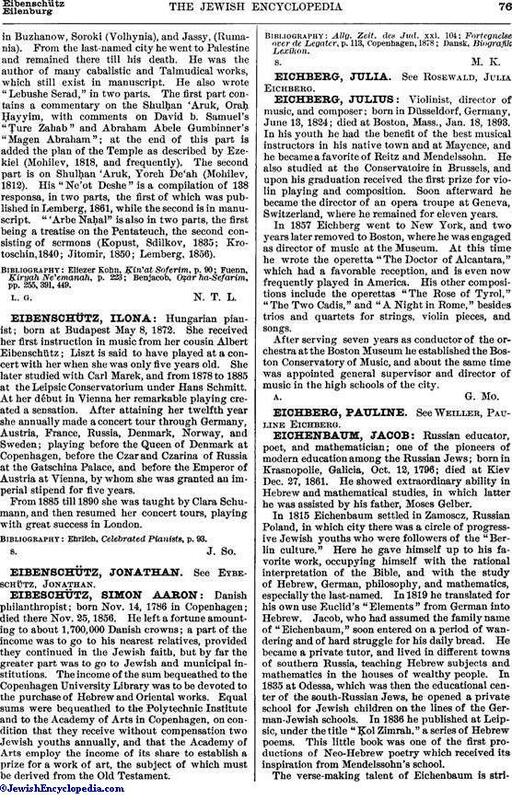 Violinist, director of music, and composer; born in Düsseldorf, Germany, June 13, 1824; died at Boston, Mass., Jan. 18, 1893. In his youth he had the benefit of the best musical instructors in his native town and at Mayence, and he became a favorite of Reitz and Mendelssohn. He also studied at the Conservatoire in Brussels, and upon his graduation received the first prize for violin playing and composition. Soon afterward he became the director of an opera troupe at Geneva, Switzerland, where he remained for eleven years. In 1857 Eichberg went to New York, and two years later removed to Boston, where he was engaged as director of music at the Museum. At this time he wrote the operetta "The Doctor of Alcantara," which had a favorable reception, and is even now frequently played in America. His other compositions include the operettas "The Rose of Tyrol," "The Two Cadis," and "A Night in Rome," besides trios and quartets for strings, violin pieces, and songs. After serving seven years as conductor of the orchestra at the Boston Museum he established the Boston Conservatory of Music, and about the same time was appointed general supervisor and director of music in the high schools of the city.